The second studio album by English musician David Bowie, released under that title by Philips in the UK, and as Man of Words/Man of Music by Mercury in the US, in November 1969. 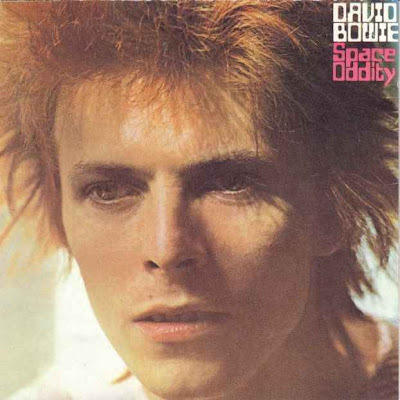 It was rereleased in 1972 by RCA as Space Oddity (the title of the opening track, which had reached No. 5 in the UK Singles Chart). Space Oddity was the name used for CD releases of the album in 1984, 1990 and 1999, but it reverted to the original, eponymous title for 2009 and 2015 reissues. Regarding its mix of folk, balladry and prog rock, NME editors Roy Carr and Charles Shaar Murray have said, "Some of it belonged in '67 and some of it in '72, but in 1969 it all seemed vastly incongruous. Basically, David Bowie can be viewed in retrospect as all that Bowie had been and a little of what he would become, all jumbled up and fighting for control..."
The album came about after Bowie had made the transition from a cabaret/avant-garde-inspired musician to a hippie/folk-based sound and as such the album is a major turning point from his 1967 debut. "Don't Sit Down", an unlisted 40-second jam heard after the album's second song, was listed as an independent track on CD releases of the album in the 1990s, but the 2009 and 2015 reissues returned the song to its original status as a hidden piece.